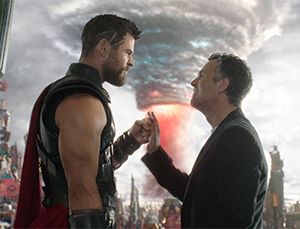 Thor: Ragnarok is so good-natured, it’s a movie practically begging to be liked. Even so, it can go begging elsewhere. The good news is it’s big, colorful, splashy, action-packed and loaded with humor. This entry in the Marvel Cinematic Universe can be safely described as an action-adventure comedy. It’s a complete 180 from the heavy-handed tone of DC’s movies, at least those made before Wonder Woman proved a DC movie can be successful and fun without the virtually humorless hands of Zack Snyder. Ragnarok follows the lead of Guardians of the Galaxy in playing up the jokes and, as with Doctor Strange (who makes a humorous extended cameo here), the story devolves into a major boss battle that lacks a relatable emotional core. An entire celestial body is destroyed, but with no sense of loss. Essentially, like Guardians Vol. 2, Ragnarok is another movie to chill to rather than thrill to. It seems as though the Marvel movies are becoming less about compelling stories and characters and more about humor and glossy CGI visuals — it’s a dance of two steps forward, one step back. The balance of comic book lore and contemporary relevance, perfected by Christopher Nolan in the Dark Knight trilogy and initially mimicked by Marvel in the simpler days of Iron Man and Captain America, is disappearing. Thor utters a great line a couple times. It could’ve been a fantastic rallying cry, a new mantra: “Because that’s what heroes do.” As Thor self-promotes himself — showing a smidge of insecurity, perhaps, when Hulk is around — he explains he runs toward problems and faces them head-on. But even this line and this inspirational Asgardian philosophy get lost in the noise, jousting and jesting. Overall, the story feels like merely a detour to go out and get a couple characters — Thor and Hulk — and bring them back to Earth in time for Avengers: Infinity War (to be released Spring 2018). That story revolves around a prophecy — called Ragnarok — regarding the fate of Thor’s homeland, Asgard, which heightens the already strained dynamics in the royal family of Thor (Chris Hemsworth, Ghostbusters), his half-brother, Loki (Tom Hiddleston, Kong: Skull Island), and father Odin (Anthony Hopkins, Silence of the Lambs). Throw in a gladiator battle with Hulk (The Brothers Bloom’s Mark Ruffalo, most of the time replaced with a giant green CGI incarnation) under the annoying auspices of the Grandmaster (Jeff Goldblum, The Life Aquatic with Steve Zissou) and those two story elements serve as the bulk of the action. Given the colorful imagery and costumes, the zany landscapes and Mark Mothersbaugh’s offbeat score, which drifts into electronica, there are times when Ragnarok feels like a tribute to 1980’s Flash Gordon. Make of that what you will. An interesting aspect of Ragnarok’s production is it brings in some new talent offering a fresh take on the genre. It’s directed by Taika Waititi, perhaps best known as the co-writer, co-director and co-star of the independent hit What We Do in the Shadows, a comedy about vampires in New Zealand (Waititi’s homeland). And Ragnarok’s written by a trio of scribes who have contributed almost exclusively to scripted superhero media — largely Marvel — for the better part of 10 years or so. Christopher Yost, returning screenwriter from Thor: The Dark World, is joined by Eric Pearson and Craig Kyle, who now have a total of one feature-length screenplay credit between the two of them. In other words, it’s a geekfest, which also makes it roughly equivalent to an odd-numbered Star Trek movie. Thor’s fans will likely adore Ragnarok, but the rest of the movie-going universe might feel a bit of a chill, witnessing the action from the outside. Here’s the underlying problem: As the Marvel universe expands, the mainstream appeal seems to be shrinking. A whole bunch of new players are introduced in Ragnarok, but none are particularly compelling to those who have no reason to appreciate the significance of appearances by characters like Valkyrie (Tessa Thompson, Creed) and Skurge (Karl Urban, Star Trek Beyond), also known as Executioner. That said, Cate Blanchett (Indiana Jones and the Kingdom of the Crystal Skull) has a lot to sink her teeth into as Hela, the Goddess of Death. She’s over-the-top, unrepentantly evil and fun as hell to watch.